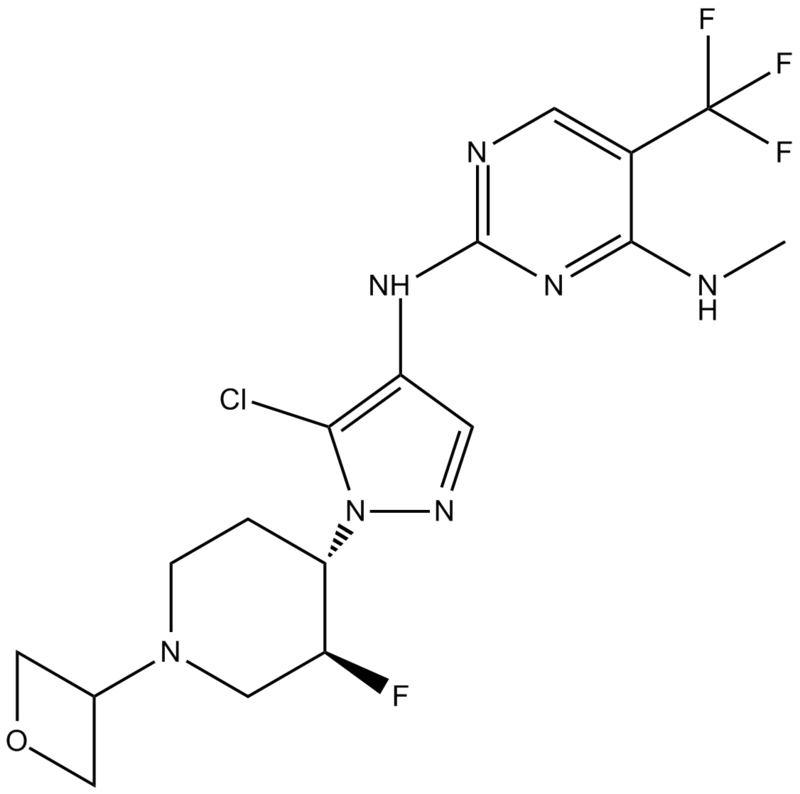 GNE-9605 is a potent and selective inhibitor of LRRK2 with IC50 value of 19 nM . Leucine-rich repeat kinase 2 (LRRK2) is a member of the leucine-rich repeat kinase family. Variants of LRRK2 gene are the most common cause of Parkinson's disease and Crohn's disease. GNE-9605 is a brain-penetrant, potent and selective LRRK2 inhibitor. GNE-9605 was highly potent against LRRK2 with Ki and IC50 values of 2.0 and 18.7 nM, respectively. In human hepatocytes and liver microsomes, GNE-9605 exhibited excellent human metabolic stability . In rat pharmacokinetic (PK) studies, GNE-9605 exhibited excellent oral bioavailability of 90% and total plasma clearance of 26 mL/min/kg. In bacterial artificial chromosome (BAC) transgenic mice expressing human G2019S LRRK2 protein with the Parkinson’s disease mutation, GNE-9605 (10 or 50 mg/kg) inhibited LRRK2 Ser1292 autophosphorylation with IC50 value of 20 nM in a concentration dependent way. In cynomolgus monkey PK studies, GNE-9605 exhibited excellent brain penetration .
. Estrada AA, Chan BK, Baker-Glenn C, et al. Discovery of highly potent, selective, and brain-penetrant aminopyrazole leucine-rich repeat kinase 2 (LRRK2) small molecule inhibitors. J Med Chem, 2014, 57(3): 921-936.